Cheim & Read is pleased to announce the gallery's first exhibition of work by Los Angeles painter John Sonsini. The show is accompanied by a color catalogue with an essay by Jeffrey D. Grove. 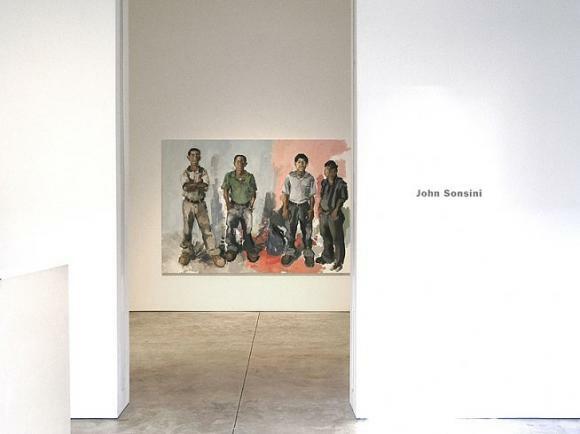 John Sonsini is best known for his lushly painted portraits of Latino day laborers, which investigate the characters and personalities of his sitters while unavoidably referencing the politics and economics of immigrant labor. Finding his models at day-labor hiring sites, Sonsini pays the men hourly (sometimes for several days) to pose for his canvases. In separating the men from their employment, Sonsini grants them reprieve not only from manual work but also from assumptions and stereotypes. In the paintings, they are asked to pose as themselves, with their own clothing, postures and expressions. Sonsini talks with the men as he paints, his curiosity about their lives and culture evident in his attentive description of their faces. Placed against unornamented and often incomplete backgrounds of brushed color, Sonsini's subjects are isolated from their everyday, "narrative" surroundings. Figures, posed in both individual and group arrangements, are slightly staged; perhaps the more theatrical compositions result from Sonsini's work with the photographer Bob Mizer at AMG (Athletic Model Guild) Studios in the late 1980s, where Sonsini painted backdrops and scenery. But the men here are not models, nor are they objectified. With hands thrust in pockets or arms crossed at the chest, they gaze directly out to the viewer, seemingly without pretension or affectation. In this way, their psychological identities emerge, the tangibility of their temperament a visible contradiction to their often-invisible role in American society. Their individuality is further realized by Sonsini's inclusion of the men's signatures to the back of the canvas, alluding to the collaborative process between the painter and his model. He also titles his paintings with the names of the men represented. Thickly painted, and with an expressionistic hand, Sonsini's work references painterly traditions and a history of artistic portraiture. Never using photographic reference for his paintings, his process is grounded in the direct observation of his subject. He deftly describes, in painted layers, the tactility, patterns, and colors of clothing, and the variations and surface of skin tone; he also employs a unique "tilted" perspective that highlights the heads, hands and feet of his subject. This physical caricature does not interfere with the sitters' gaze, which rewards the viewer with a sensitive and honest glimpse of the men's characters, distinct from their more faceless role in everyday America. The 56 year-old Sonsini has had exhibitions at the Los Angeles County Museum of Art, the Museum of Contemporary Art in San Diego and the San Jose Museum of Art. His work was recently acquired by the Museum of Fine Arts in Boston and the High Museum in Atlanta.